The design of Tieramid Creative Blocks was influenced by Friedrich W. Froebel, the originator of the "kindergarten system". "Kindergarten was designed to teach young children about art, design, mathematics, and natural history." [source: Froebel Web]. One of the first developmental toys Froebel created was a wooden cylinder. It represented a transitional form between the sphere and the square. Tieramid expands on this cylindrical structure and educational concept. • With these nested blocks younger children learn hand-eye-motor coordination skills and physical relationships of "large and small", "inside and outside", "up and down". They learn the primary colors of red, yellow, and blue. They also learn the secondary colors of orange, green, and purple. • Elementary school children enjoy building complex play structures, and play/practice adult roles. • Adults find it challenging to make visually appealing configurations or share games with children. • People seeking rehabilitation can use Tieramid as a fun, engaging way to improve abilities. 2.Tieramid Creative Blocks can fit together or stack in an unlimited number of ways, both 2 dimensionally and 3 dimensionally. 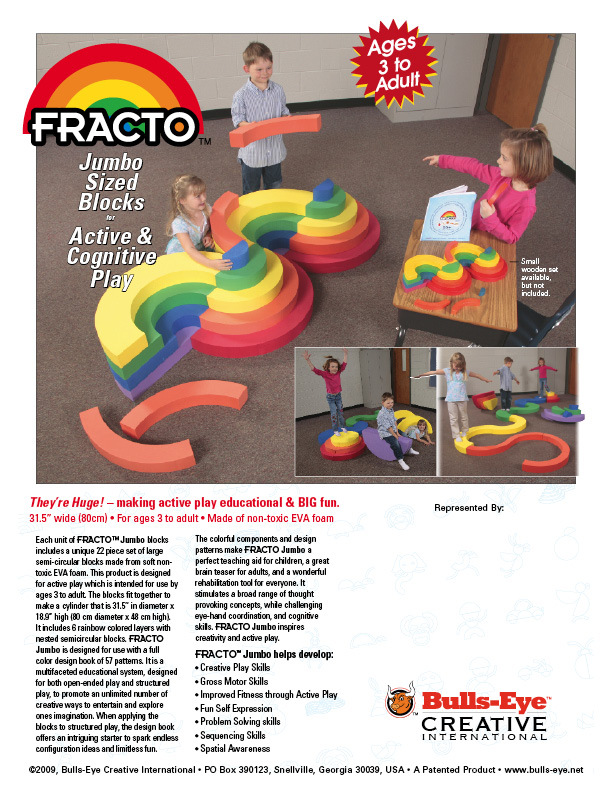 As cylindrical puzzle blocks they can be used for structured play. They are also designed to allow for open-ended play which promotes creative, imaginative thinking and problem solving. A child may associate the same yellow arch with a banana, a telephone, or even a smile. 3.Tieramid Blocks lay a foundation for math skills development. Each piece has a mathematical relationship to another based on a 1:10 ratio. Copyright 2010, BULL’S-EYE PROMOTIONS, INC. All rights reserved. No reprint or reposting of the contents of this page its to be made for advertising, sales, or promotional purposes without the expressed written consent from the management of Bull's-Eye Promotions, Inc.